The Holsworthy Community College PE department’s bi-annual Spain trip will again be taking place in June next year. To try and raise some funds for additional activities for the group whilst they are there, a raffle of prizes is being organised, with each student going on the trip being asked to try and sell at least 20 tickets at £1 each. Lots of chocolate, a scarf, 9 piece mug/straw and lid set, Dartington Crystal, body wash, beer glasses, lots of wine (red/white/rose), headphones, Waitrose dining mugs, marzipan memo pad, travel kit for men, wine and chocolate gift pack, woman’s gift packs, candle, Prosecco, makeover portfolio, ice cream set, John Deere toy, Diggerland voucher, free family swim at 1610, cake and coffee vouchers x 6 at Filter Through coffee lounge, £20 for Mole Valley Farmers, £10 Mole Valley Farmer voucher, £25 Holsworthy Golf Club restaurant voucher, Plymouth Argyle Gnome, £20 Fat Face gift card, 2 x adult carvery meals at the Bickford Arms at Brandis Corner, 2 x meals at the Crown and Sceptre, £10 Waitrose gift card, £10 voucher for The Hair Shop, Tamar shooting ground taster session to the value of £40, £50 John Lewis/Waitrose voucher, £20 Next voucher, 4 people to have a round of golf at Holsworthy Golf club, The Green Dragon Inn x 2 persons for a traditional Sunday carvery. 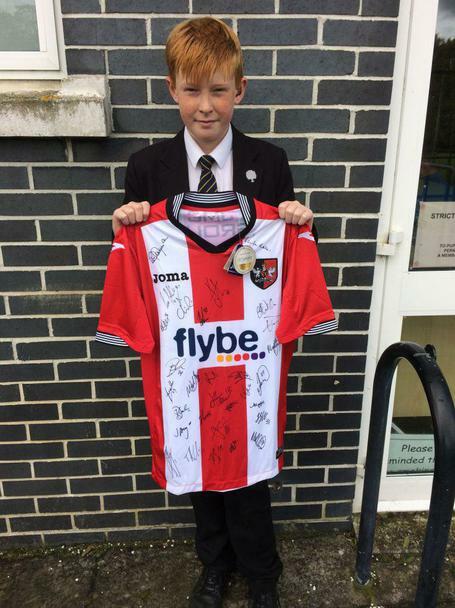 We have also had an Exeter City Football Club shirt, signed by the players, which is being auctioned by silent bids, with a minimum bid of £40. This fantastic prize has been donated by Ryan Bewes. If you would like to bid on the shirt please either email svanstone@hcc.devon.sch.uk or hand in a written bid, in a sealed envelope for the attention of Mr Vanstone by Friday 20th October. We would like to thank everyone for their very generous donations.